I spoke at the Indiana Municipal Authority – in the room were senior executives of small and mid-size power generation/utility companies from throughout the state. Representing communities of a few thousand people to mid-sized cities, the event and my keynote were the future trends impacting the electrical grid, energy generation and more. I think we quickly came to agreement that only idiots loudly proclaim that windmills cause cancer, and that you can’t watch TV with wind-generated power when the wind stops. (Because, batteries). The quote in the picture captures the essence of my response. When faced with a barrier, you can try to go through it – or you can change it. 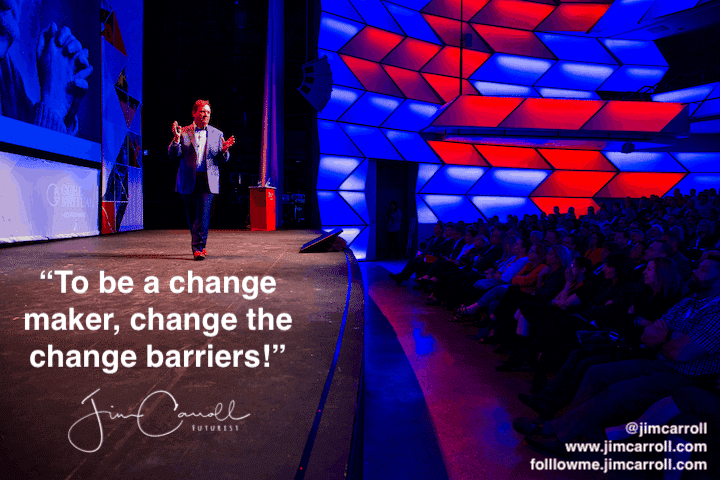 On a personal perspective, what change barriers do you encounter that are self-imposed? Due to circumstances beyond your control? Which ones are minor and easily managed, and which are probably too big and significant to make any progress? Parse them down into those that are actionable, and those that are not. Control what you can control, and put the others on the back burner as long as you can while you figure out what to do with them. And as you start to think through solutions, keep this path in mind – hat can you do about them if you think creatively, as opposed to trying to barge your way through?